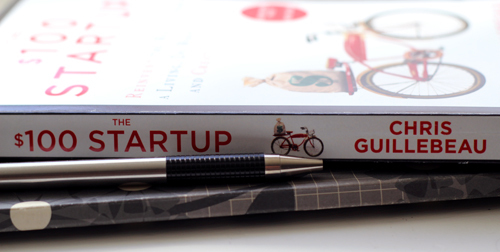 When Chris Guillebeau e-mailed me to say a copy of his new book The $100 Startup was on its way, I groaned. Yes, I acknowledge I’m a brat. In my defense, I was in the midst of a business-book-reading hiatus. I’m deep into hard-core implementation mode. Additionally, I wasn’t clear on what I’d get out of the book. After all, I’ve already started — and with more than $100 in my bank account. However, I like Chris — as a person and because he’s a good storyteller. A rare quality in a blogger, I find. I broke the hiatus. Good thing. I love this book. The $100 Startup promises to show you how to live a life of adventure, meaning and purpose — and earn a good living. And it delivers. Chapters like “Give Them the Fish” and “An Offer You Can’t Refuse” are written for first-time business owners. Yet, they also offer a gentle reminder to those of us who filed away our business planning exercises a year ago. Imagine a life where all your time is spent on the things you want to do. Imagine giving your greatest attention to a project you create yourself, instead of working as a cog in a machine that exists to make other people rich. Imagine that today is your final day of working for anyone other than yourself. What if — very soon, not in some distant, undefined future — you prepare for work by firing up a laptop in your home office, walking into a storefront you’ve opened, phoning a client who trusts you for helpful advice, or otherwise doing what you want instead of what someone tells you to do. Yep. That pretty much nails it. 3. The $100 Startup is based on more than Chris’s personal experience. If I have any single criticism of online entrepreneurs and advice-givers, it’s this: Stop assuming that what works for you is right for me. Chris successfully dodged that bullet by including 50 case studies in the book, which were culled from a group of 1,500. The strategies and tactics for building your business aren’t good “because Chris says so,” they’re proven by hundreds of success stories. Who should read The $100 Startup? You know I’m big on tuning out the noise and finding your own path. I also read approximately a book a week, because I believe strongly in continual education (also: books = vital life force). It’s a bit of a paradox, but as a result, I’ve developed a strong filter. There’s some awful stuff out there. This book is not on that list, both for the reasons above (the process is pragmatic, aspirational and proven) and because Chris is a strong writer. Seeking a refresher or encouragement to jump-start new ideas. Secretly dreaming of starting your own business. For this group, in particular, The $100 Startup is a killer resource. If you have a dream and think it’s crazy impossible or out of your reach, drop your plans and start this book tonight. As a final note, I wanted to let you know that Chris is going on tour to promote the book — and I’ll be at the San Francisco event on May 29th! I’d love to see you there. If you’re planning to attend the event, let me know in the comments, so we can be sure to connect. Did you know I interviewed Chris during his last book tour? Probably not! It was nearly 2 years ago, and I was still a design blogger. Chris and I met during his stop in Chicago, and he was gracious enough to answer my questions on personal drive, creating legacy and blogging. Disclosure (because I’m classy like that). I received an advance copy of The $100 Startup for review purposes. While I like Chris and appreciate the copy, I would never, ever, ever, ever (seriously – yuck!) recommend something to you I didn’t back 100%. The links above are to my Amazon store. If you don’t like the idea of Amazon paying me a small commission for the link, then don’t use it. I won’t mind, pinky swear.